Also available in Kindle Unlimited! After losing her mother to an unexpected illness, and unable to locate a sister who is MIA, Pepper has to come to terms with being alone for the first in her life. She refuses to sit still and feel sorry for herself. Reviving her herb garden becomes her first project and she conjures a potion to help it flourish. As she performs the spell, a silver wolf stumbles into her backyard, his focus on her. Knocking the magical potion from her grasp, he shifts into a hot and very naked man. Wes Nash never expected to scent his mate while on a run. Seeing her in the flesh, tending to her garden by moonlight, is too much for him to deny. 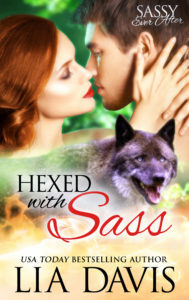 Little does he know the witch accidentally puts a hex on him, and not just his heart. Now, everything he touches sprouts leaves and flowers. But the screwed-up version of a green thumb is the least of their worries. Pepper discovers a secret her mother didn’t get a chance to share before she died, and now the father she thought was dead comes back with dark plans of his own.